Source: Loosely based on a Canadian Living recipe. I made this and they were incredible! but can I make it with veggie oil instead of margarine? So glad you liked them Michal :-) I must admit I love these the way they are so haven't tried replacing any ingredient. Plus, I wasn't aiming for a "healthy" chocolate chip cookie here, I just wanted a vegan chocolate chip cookie that tastes just like "regular" chocolate chip cookies. That being said, vegetable oil isn't really any healthier than margarine, well, depending on your brand of margarine, not all are the same. I use a non-hydrogenated margarine, I believe most are these days. Still, you can try with veg oil, but I feel the dough will be too 'wet' and the recipe would need adapting. 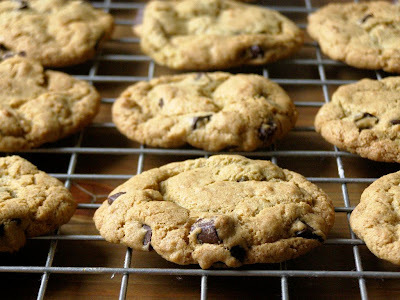 I made these today and they are the best vegan cookies I've ever tried! So simple and delicious.